Introducing the NovaCHROM 5000 GC System which has been specifically designed for the quantification and identification of Sulphur based components in a sample stream. 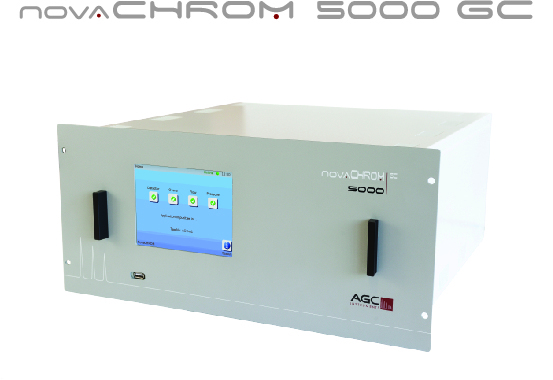 The NovaCHROM 5000 GC contains the latest GC technology based around the industry proven Flame Photometric Detector (FPD). This rugged detector design, of which AGC Instruments has extensive experience, is ideal for both cost effective and reliable gas analysis. Utilising the latest advanced technologies, this GC provides customers with the precise results they require where the measurement and quantification of any sulphur related compounds are required. Typical impurities range from H2S, SO2, COS, CS2, Methyl Mercaptans, Ethyl Mercaptans…etc. depending on the application and background gas. The NovaCHROM family is an on-line GC solution using an interactive 6.5” colour touch screen display and availing of our Electronic Flow & Pressure Management System. All parameters and readings are easily viewed which ensures a straightforward functionality and accessibility with minimum training required. The GC is easy to install & set-up. Depending on the design configuration, the 19”/5U configuration allows it to be retro-fitted into a standard Industrial Rack Cabinet. All fittings on our NovaCHROM 5000 GC are 1/8” Swagelok fittings which mean all our pipework (1/8” or 1/16”) have excellent seal rates and expect zero leaks. Being specific to Sulphur compounds, all pipework is resistant to these components and we always ensure that we adhere to the specific requirements of these reactive compounds. For more information NovaCHROM 5000 GC please contact us directly.